Being a real estate agent is often a lot like being a party planner. There are several people and issues that need to be kept up with, and consistently held to account. Part of making sure that the party goes off without a hitch when working with a homebuyer is making sure that they have a financial plan to execute the purchase. Most people like to keep their finances rather private, so it’s important that people know that making that plan can be done in private. I often recommend that people use a few different free services to monitor their finances and credit: Mint.com, and Credit Karma. They both run ads, but if you can just ignore those you can be a step ahead. Feel free to send me a message if you have any questions about either one of those services. Now, read this article and if you don’t have these basic financial tools in place start setting them up. You can do it – now let’s make a plan and throw that party! Part of the reason we accumulate debt is that there are so many distractions in our lives – things we want to buy but don’t need. But we also ring up debt because we simply don’t understand the flow of our income and expenses, so we can’t accurately estimate how much money we have available to spend. I’ve struggled with this myself. 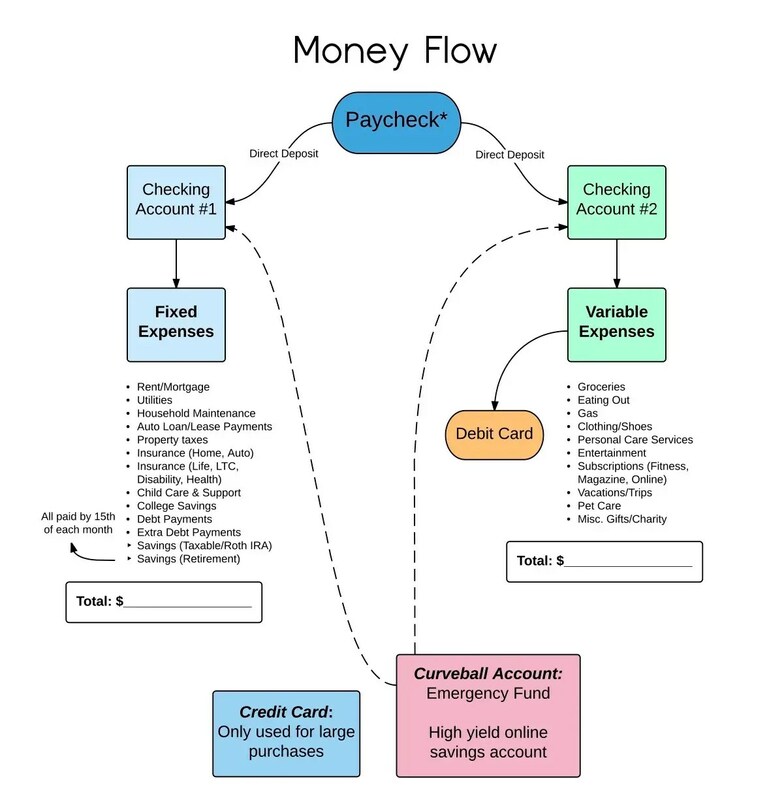 A few years ago, I put in place a “Money Flow” system to help my family track our spending. You may have heard of a system like this before, but follow along on this tour, because it really works. One to pay fixed expenses (such as the mortgage, car payments and utility bills). One to pay variable expenses (groceries, gas, clothing and so on). 2. Set up a high-yield online savings account. We call this our “curveball” account. It’s an emergency fund for use when life throws us curveballs – large medical bills, a job loss or reduction in income, major home repairs, that kind of thing. 3. Make a plan for big-ticket items. My husband and I agreed that we would use one family credit card for large purchases, such as airline tickets and hotel stays. We still have our separate credit cards – it’s wise to keep your own credit cards to maintain your credit score and credit history. Using them once or twice a year should be sufficient. And don’t close those cards because it will affect your overall credit score. 1. Draw up a budget for fixed and variable expenses. Add up how much you need in each category. This will be your guideline for how much should be in each of your checking accounts. 2. Distribute money to the accounts. When your paycheck comes in, allocate the designated amounts into each checking account based on the budget you created. The sum earmarked for the curveball account can go there directly. 3. Pay fixed costs directly. All bills are paid automatically from our fixed-expenses account. We do not have to write any checks, and no debit card is necessary. This account has a cushion of a few hundred extra dollars in case a bill shows up unexpectedly or before we have a chance to replenish the account. 4. Pay variable expenses from the second account. This account should have a debit card, which you can use for purchases. 5. Link the curveball account to either checking account. If an emergency arises, you can transfer funds within 24 to 48 hours. You can then access the money with a check or debit card. Once I implemented this system, the process of tracking expenses wasn’t so cumbersome anymore. Separating expenses into fixed and variable categories meant I didn’t have to worry constantly about checking account balances. Having fewer transactions in each account also made it easier to see the bigger picture of our spending. The chart below depicts the flow of money. Every family’s finances are different, of course. Feel free to customize my system as necessary. The point is to get – and keep – a grasp on the flow of your money. If you know exactly what’s coming in and going out, you can’t be surprised by debt. One thing that seems more and more clear to me is that so goes millennials so goes the nation in next decade. If millennials decide not to buy houses there is going to be a large wealth shift – we will become even more of a renter society. So, a stable housing market that young people want to participate in matters. A lot of people are outraged by our nation, and world’s growing wealth gap (and in many ways rightfully so), but not participating in ownership of housing could be one of the greatest factors in the next great wealth shift. A lot of numbers show that young people do want to own their own stuff, and have a more self-sustaining lifestyle in a lot of ways. I’m just very curious which direction my peers and I are going to trend towards in regards to housing. The Fed’s move to increase interest rates in December reflects the major strides the U.S. economy has made as it emerges from the Great Recession. Higher rates (though they haven’t happened yet), along with rising prices and limited supply, will make it harder for some to afford a new home. The good news: Long-term mortgage rates will see only a gradual increase this year and will remain relatively low compared with what they were before the downturn. Thirty-year fixed-rate mortgages, which averaged under 4% for most of 2015, will average 4.4% this year, according to Freddie Mac. Meanwhile, housing data firm CoreLogic, in its latest U.S. Economic Outlook report, predicts mortgage rates will increase roughly half a percentage point in 2016 over 2015. Where 15 Can Beat 30 – What Kind of Loan Should I Get? With rates changing (if you don’t know about this it’s ok, but they are…) have you wondered how that might affect the loan that you should consider taking out for your home? Well, here is a very wonky article that can help you dive into this under discussed, and very important topic. It might be a good idea to play around with a mortgage calculator to see what the difference might be for you. The Federal Reserve Board is on track to raise interest rates as soon as today. It’s a move that will mean higher mortgage rates, higher monthly payments, and reduced purchasing power for new borrowers. Homebuyers, who haven’t seen an interest rate increase in nearly 10 years, may be tempted by lower-rate 15-year mortgages. A 15-year mortgage is a smart choice for households in housing markets where price increases have been modest, but a tougher call for households in hotter markets. The Federal Reserve Board is on track to raise interest rates as soon as today. It’s a move that will mean higher mortgage rates, higher monthly payments, and reduced purchasing power for new borrowers. Homebuyers, who haven’t seen an interest rate increase in nearly 10 years, may be tempted by lower-rate 15-year mortgages. But do the advantages of a 15-year mortgage outweigh the costs? The answer depends partly on where you live. With the median US household income, a 30-year mortgage allows homebuyers to purchase 46% more house, but a 15-year mortgage provides triple the paid equity in just 5 years. Homebuyers in areas where prices have a history of rising will benefit greatly from faster equity-building with a 15-year mortgage. Buyers in areas with historically slow growing to flat housing prices will benefit less from shorter-term mortgages and potentially more from the borrowing power of a 30-year loan. The primary advantage of a 30-year mortgage is lower monthly payments. On the median valued U.S. home, a 30-year mortgage comes with a payment that is $320, or 27%, lower than a 15-year mortgage. Lower payments also mean that a borrower’s debt-to-income (DTI) ratio is lower than a 15–year loan. This allows middle class buyers (a household earning the U.S. median income) to borrow $77,000, or 46%, more with a 30-year mortgage than a 15-year. Last, borrowers with a 30-year mortgage can write off nearly $68,000 more than a 15-year mortgage via the mortgage-interest deduction on their federal income taxes. The primary advantage of a 15-year mortgage is that a larger share of each monthly payment goes towards paying off the loan principal. After five years (the number of years the average young household moves), equity gained from paying off the loan balance is more than $39,000, or three-times greater with a 15-year mortgage on the median value home. In addition, the 15-year rate is 3.36%, compared with 4.12% for a 30-year note. And over the loan term, borrowers with 15-year mortgages pay just under $40,000 in interest with a 15-year compared to over $107,000 with a 30-year on the median value home. Home equity can come from three sources: down payment, principal reduction, and home value appreciation. This means that in markets with slow appreciation, a larger share of equity will come from homeowners paying down the loan balance when compared to home value appreciation. In such markets, 15-year loans offer a relatively faster route to building equity. We’ve identified the 10 markets in the country where, after five years of ownership, homeowners will have the most equity from principal reduction relative to home price appreciation. At the top of the list are markets exclusively in the Bargain Belt (Midwest and Southeast). In each of these markets, 15-year mortgages can provide over twice the equity relative to home price appreciation. For example, homeowners in Dayton, Ohio, can earn $22,018 in equity from mortgage payments with a 15-year mortgage, which is 2.37-times greater than the $9,295 gained from price appreciation. With a 30-year mortgage, payments would net households just $7,393. Clearly, household in these markets would gain much more equity by paying down their mortgage principle with a 15-year loan than from home value appreciation. In markets with strong home price appreciation, deciding between a 15-year and 30-year mortgage is a tougher call. Like bargain markets, 15-year loans provide more equity from principal repayment than from appreciation. The difference, however, is much smaller. In pricey San Francisco and San Jose, Calif., 15-year mortgages provide just 1.35 times more equity from principal payoff than appreciation. Still, the difference in equity from principal repayment is great between a 30-year and a 15-year mortgage. For example, households in Orange County would stand to gain nearly $100,000 more in equity after 5 years by choosing a 15-year mortgage. Even though 15-year mortgages provide more equity through loan repayment than appreciation, they also come at the expense of borrowing power. In high-priced markets, the difference in nominal terms can be substantial. For example, middle class families in San Francisco (households making the median income of $104,000 per year) could purchase a $628,000 home with a 30-year mortgage but only a $430,000 home with a 15-year. This makes house hunting hard when the median priced home costs more than $1 million. As a results, this could be the difference between buying their dream-home or a starter for some households. To show why households in expensive housing markets have a much tougher decision, we’ve put together a scatterplot of median home values for each of the 100 largest U.S. metros and matched it with the relative amount of equity a household can gain from payments on a 15-year mortgage. As you can see, households in cheaper markets (bottom axis) stand to gain relatively more equity (left axis) from paying down their mortgage with a 15-year note than through home value appreciation when compared to pricier markets. For example, households in affordable Cleveland, which has a median home value of $123,000, can reap 2.25 times the equity from loan repayment than appreciation. In San Francisco, the land of million dollar homes, the added value is only 1.34 times the equity. The takeaway: 15-year mortgages are a great option for those wanting to build equity, regardless of how expensive or how fast growing a market is. However, in places with historically low appreciation, 15-year mortgages are a much better deal for building equity because it’s about the only way to do so though paying of the loan balance. On the other hand, in areas with historically high price appreciation that also happen to be expensive, households need to consider the tradeoffs between the borrowing power of 30-year mortgages, expected equity from home price appreciation, and whether or not they will use equity from their existing home as a down payment on their next one. To compare 30- and 15-year mortgages, we estimate the amount of equity a household would gain from both appreciation and from paying off the principal after 5-years of homeownership of the median valued home. We estimate this separately for each of the 100 largest U.S. metros, and use an annualized 20-year Federal Housing Finance Administration (FHFA) house price growth rate to project home values 5 years into the future. Last, we compare the nominal and relative amount of equity a household would gain by choosing either a 30- or 15-year mortgage and comparing that to the expected gain in equity from home value appreciation.